Around 500 Non-Chinese Speaking (NCS) students are studying in Hong Kong Institute of Vocational Education (IVE) and Youth College (YC) this academic year, and the number is on a rising trend. In view of this, a workshop on “Understanding Race Discrimination Ordinance (RDO) for Managing a Classroom of Students with Diverse Racial Backgrounds” was organised by Centre for Learning and Teaching (CLT) on 14 October 2016, to enhance teachers’ understanding on nurturing an inclusive learning environment, with a focus on RDO. Ms Kayla Tam, the Campaign Officer from Hong Kong Unison, was invited to explain the RDO and share cases in this aspect. Some key concepts and examples on RDO were introduced. They are summarised in the following. Ms Kayla Tam, Campaign Officer of Hong Kong Unison introduces the RDO and shares her experience in handling cases to the participants. What is Race Discrimination Ordinance (RDO)? The Race Discrimination Ordinance (RDO), which came into operation since 2009, is an anti-discrimination law that protects people against discrimination, harassment and vilification on the ground of their race. Under the RDO, it is unlawful to discriminate, harass or vilify a person on the ground of his/her race. According to Hong Kong Unison, racial discrimination is about treating people less favourably on the basis of their race. In general, there are two forms of racial discrimination: direct discrimination and indirect discrimination. 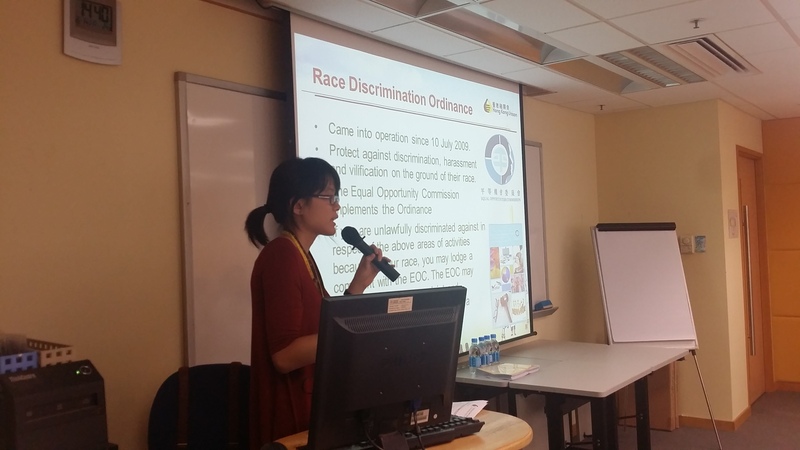 Direct discrimination occurs when a person is treated less favorably than another under comparable circumstances because of his/her or his/her near relative’s race; it is also direct discrimination to segregate a person on the basis of his/her race (extracted from the webpage of Hong Kong Unison). Take a simple example, if a Chinese student taunted an ethnic minority student at school saying, “Your skin is too dark and you look like a monkey!” The Chinese student’s action is considered as direct discrimination. Indirect discrimination occurs when a same requirement (rule, policy, practice, criterion or procedure) or condition, which cannot be justified on non-racial grounds, is applied equally on people of different races but which has an unfair effect on a particular group because only a small proportion of people from that racial group can meet that requirement compared to the proportion of people of other racial groups; and/or the condition is to the detriment of the persons of that particular group because they cannot meet it (extracted from the webpage of Hong Kong Unison). For instance, a teacher told a Muslim student, “You could not wear a headscarf back to school because you study at a Catholic school.” The headmaster of the Catholic school was a nun and worn a head cover. The teacher’s action is considered as indirect discrimination. An NCS student educated in HK wanted to enroll to a course which was advertised to be taught in English. He was not proficient in Chinese. After the interview, he was warned by an admission officer that he would encounter difficulties during the compulsory placement since all the paperwork at placement organisations would be in Chinese. He was told that he might fail the course if he could not complete the required placement hours. The admission officer suggested him not to waste his time and not to take the risk of enrolling to this course. In addition to direct and indirect discrimination, racial vilification and racial harassment also deserve our attention. Extracted from the webpage of Hong Kong Unison, racial vilification is an activity in public which incites hatred, serious contempt for, or severe ridicule of a person because of his/her race. Any racist incitement involving threat of physical harm to persons or their property or premises is considered serious vilification. If a person engages in an unwelcome, abusive, insulting or offensive behaviour because of another person’s or his/her near relative’s race, which makes him feel threatened, humiliated or embarrassed then it is racial harassment. Racial harassment can be in any form—physical, visual, verbal or non-verbal—and even a single incident may constitute racial harassment. Answer: This case is considered as neither direct nor indirect discrimination. Best viewed with Chrome , Firefox , Safari and Internet Explorer 10 or above. This site does not fully support Internet Explorer 6, 7 and 8.